This objective is concerned with encouraging growth, development and investment of businesses which complement and build on the strengths of the Cathedral Quarter. The Cathedral Quarter BID work closely with partner organisations such as Marketing Derby and Derby City Council as well as with commercial agents and landlords, to continue to develop the Cathedral Quarter as a quality business, retail, culture and leisure destination. The Cathedral Quarter BID works with landlords and agents to provide solutions to vacant properties in the area. 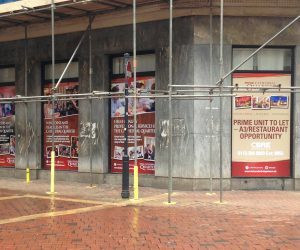 This includes the installation of window vinyls at key locations, improving the appearance and marketability of derelict sites and vacant properties. 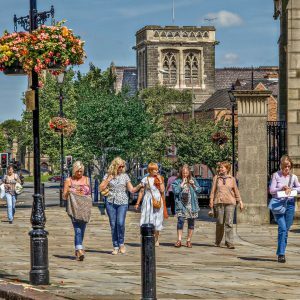 Together with Derby City Council, the Cathedral Quarter BID funds the installation and maintenance of three footfall cameras in the area. This allows the BID to monitor performance against other towns and cities both regionally and nationally and also provides a useful tool to help attract potential new businesses and investors. Partnerships for Better Business (pfbb uk), contract managers for the Cathedral Quarter BID, operates a weekly sales and footfall monitor scheme providing a comprehensive report containing the latest information on weekly footfall, local and national footfall and sales trends, and sales in the city by business sector. To sign up to the Retail Sales Monitor scheme or for more information please contact the BID office on 01332 419053. The BID regularly hosts meetings and seminars for businesses in the area which seek to provide relevant information, develop skills and have a positive impact upon business performance and future business development. Examples of such events include the Google Digital Garage, Cathedral Quarter BID Launch and GDPR seminar.